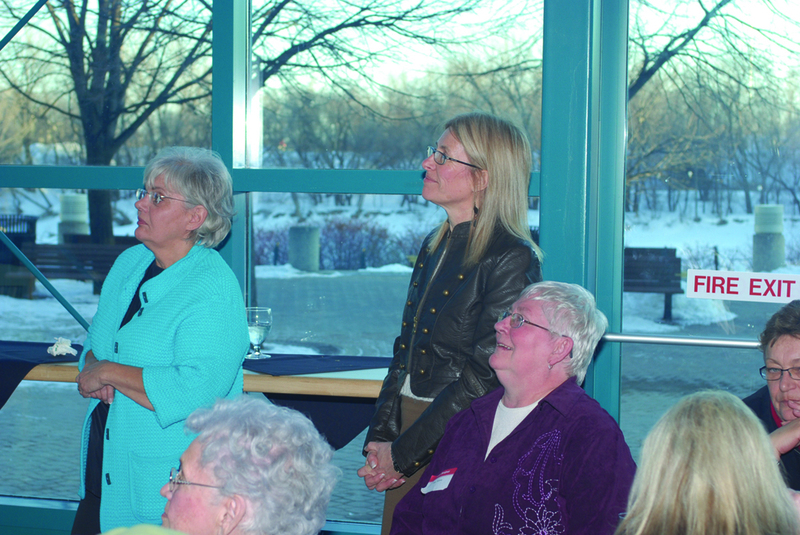 A social event at the Forks atrium – Gwen Bartel is holding speaking notes for Marty Rabu. Gwen has a podium in front of her and Marty Rabu is presenting. In the picture, he looks like he is signing the word ‘interpreting’. Behind Gwen and Marty, outside of the Forks’ atrium window you can see spotlights (red) and there is snow on the ground. (ECCOE’s 30th Anniversary). 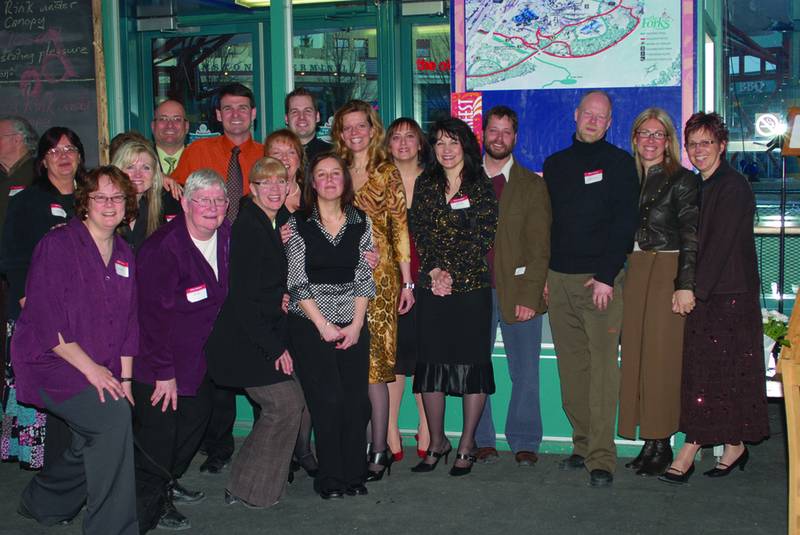 ECCOE staff: backdrop is just outside of the Forks Market ECCOE office – the group is standing in a row shoulders to the brick wall. Forefront is Shaina Dumont, Brenda Rutherford, Bonnie Heath, Candy Badger, Tania MacNeil, Jane Langes and Scotty Dure. 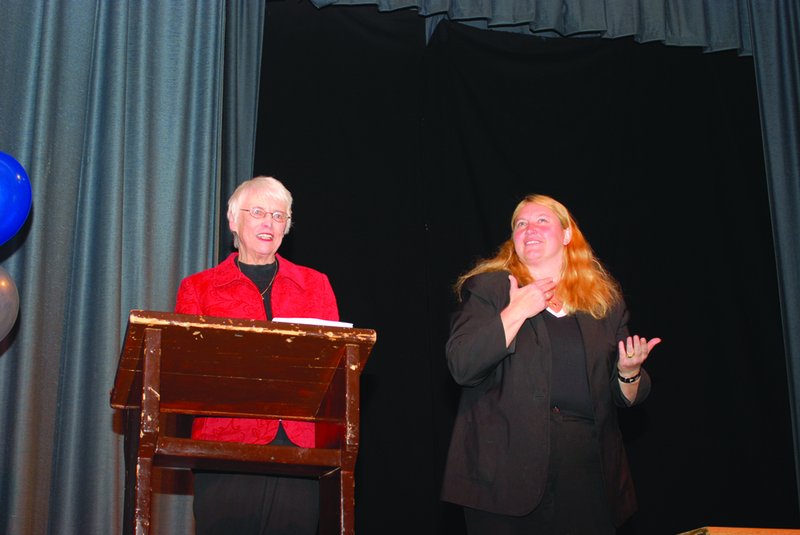 Picture of Angela Stratity, Bonnie Heath, and Sue Tebow – all three are looking to the Left at something not visible in the picture. Angela Stratiy and Bonnie Heath are standing while Sue Tebow is seated. The picture is at the Forks Market atrium, and you can see a ‘fire exit’ sticker on the window and it is winter time, dusk. (ECCOE’s 30th Anniversary. Group shot of various people at the 30th ECCOE anniversary: Front row: Monica Furer, Sue Tebow, Candy Badger, Brenda Rutherford, Jane Langes, Monica Ruiz, Johnny Hawkins, Robert Weaver, Bonnie Heath and Sue Schmidt. Sara Quinton has a microphone in her hand (she is wearing a white sweater, with grey pants) on the right side of her, there is a bouquet of blue and pearl helium balloons. Ava Hawkins is on the left hand side of Sara interpreting. The back drop is a stage with a dark background. Pamela Friedrich (far left), Bonnie Heath (middle) and Jane Sayer on the right. All three are standing and Pamela is in a royal blue suit, Bonnie has on a white jersey shirt and over top she is wearing a light coloured blazer, Jane Sayer has on a blue striped shirt and overtop sapphire shirt/jacket. Gayle Northcott and Bonnie Heath have big smiles on their faces and support persons at the Cuban hospital are surrounding wearing nurses type of uniforms, light in colour and all are smiling brightly. Board members (at the time of photo), ECCOE’s 30th anniversary - All members are standing and the backdrop is the Forks Atrium. At the far right is Bonnie Heath, next to Bonnie is Rosalyn Sutley and beside her is Terry Trupp , then Junling Wang, Veronica Nickerson, Bruce Koskie and Sheila Montney . Standing in the back row is Theresa Anne Swedick and beside her is Howard Miller.